Respite care helps both seniors and their family members enjoy a better quality of life. Meeting the ongoing care needs of an elderly or disabled loved one is a physically, mentally, and emotionally demanding job, requiring time for the family caregiver to rest and relax on occasion. 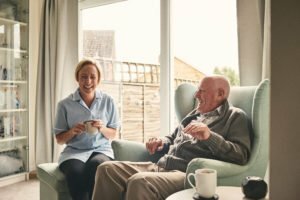 Respite care allows for the relief needed from the daily tasks of caregiving, allowing the family caregiver to also care for himself or herself. Relief from ongoing care responsibilities allows seniors to still receive the attention they deserve. Respite care provides family caregivers with care that is planned, temporary, intermittent and substitute. Time required for respite can vary, from just a few hours one day to ongoing, scheduled, routine relief. Offer to take turns in providing care. Even if you can only help once in a while, it lets the family caregiver know that you are thinking about his or her health. Offer to assist with the family caregiver’s own personal chores. Family caregivers have their own lives too, and finding time to take care of their own laundry, shopping, or housecleaning can be difficult. Pitch in for respite care services from a professional home care agency, like Hired Hands Homecare. Often, family members who live at a distance want to be able to help in some way with a loved one’s care. Paying for respite care not only helps the senior, but his or her family caregiver as well. Ask for help. Friends and other family members are likely available to assist in some way with caregiving. Involve them in the respite care plan so you can take time off when needed. When friends and family are not available, arrange for respite care with an in-home care agency, like Hired Hands Homecare. Professional caregivers can help family caregivers take the breaks in providing care that they need while ensuring quality care for their loved ones. Stick to your plan. Taking time away from your caregiving duties is vital to your health. Make sure everyone involved in your respite care plan is on board so that you can take much-needed time to care for yourself. The bottom line is, no one person can do everything alone, and there is professional help available through Hired Hands Homecare! Providers of the top senior care Santa Rosa, CA and the surrounding area has to offer, we’re available for as much or as little care as needed. Contact us online or call (866) 940-4343 to learn about our in-home respite care services.